This post was originally published June 14, 2008. It has since been updated to include more information on the technicalities of homebirth. I’ve noticed more queries asking if VBAC is illegal. VBAC is not illegal anywhere in the USA. It is legal to have a hospital VBAC in all 50 states. It is legal to have an out-of-hospital VBAC in all 50 states. If someone has told you that VBAC is illegal, they are either misinformed or they are intentionally misleading you for a variety of reasons. Ask them to show you the law. This is something you should be able to easily look up through a google search. You won’t find it because it doesn’t exist. I also think it is important for women to know that OOH (out-of-hospital) VBAC whether home or boat or rv in the parking lot of the hospital or motel or unlicensed birthing center is also legal everywhere. What may not be “allowed” by state regulation or law varies from state to state but if restrictions are present, it is in the form of restrictions on the license or practice of the practitioner IF she is a midwife (MDs can do what they want, although their peers may give them other headaches for attending an OOH birth). Birth Centers with a license from their state often have restrictions specified in the law or their regulations (force of law) which mean they could lose their license if…and then VBAC.. breech.. multiples.. may be specified along with other restrictive language decided by their state regulatory board. And I know what I am speaking about, because the small group of midwives I originally worked with in Santa Cruz took our arrests to California’s State Supreme Court over the licensing issue! So when you hear the term “it is illegal to VBAC,” it is referring to the fact that it is illegal for a non-doctor to attend homebirths. The physical act of giving birth in your home is not illegal. If you are planning a hospital birth, and you don’t make it the hospital in time and end up giving birth in your bathtub, you did not do anything illegal. [If] there aren’t laws specifically naming midwives as illegal… it leaves the impression that they aren’t illegal — which isn’t true. They are illegal because they are practicing medicine without a license. They aren’t illegal because they ARE midwives, they are illegal because they AREN’T doctors. Unless there is legal language making them legal, they aren’t. Now, fortunately, this is pretty irrelevant in most states, still….. Some states, like New Jersey, permit midwives to attend homebirths, but not homebirth VBACs (HBACs). In other states, like California, homebirth and HBAC are legal for midwives to attend though you technically need to use your right of informed refusal to have a HBAC. Some states have legislation prohibiting homebirths or birth center births with midwives, and in those states HBAC would also be considered illegal for them to attend. Then there are states that permit some midwives, but not others, to attend homebirth. Iowa and North Carolina permit certified nurse midwives (CNMs) to attend homebirths, but not certified professional midwives (CPMs). There is currently a bill providing for licensure of CPMs in Iowa. Learn more about House Study Bill 229 at Friends of Iowa Midwives. So why would someone tell you that VBAC is illegal? Three reasons. First, it ends the conversation. One might be apt to debate or look for another care provider if they are told “our hospital doesn’t permit them” or “this OB doesn’t attend them.” But if you are told it’s illegal, well, most women would just resign themselves to a scheduled repeat cesarean since many women do not want a OOH VBAC. Third, to say something is illegal makes it sound really dangerous, risky, and against the common good. So by continuing the myth that homebirth is illegal, it’s feeding into the notion that no reasonable person plans a home VBAC, when it reality, it is perfectly legal for your OB to deliver your baby at home. What stops them is a mix malpractice insurance pressures, pressure from other doctors, and the real belief that many OBs have that birth is a dangerous event. In a state where there is no Midwifery Practice Act, you’ll need to depend on your midwives to know what the “climate” for them is like — mine practice openly, advertise widely, go with all their transports, etc. But they ain’t legal. So, look around. You may find that you have options you didn’t even know about. Ready to plan your VBAC? Download my VBAC checklist to get started. I live in NJ and was curious how we can petition or try to change the law on homebirth VBACs? Any ideas? Thanks. I do not know, but I will post your question on my FB profile and page to get more input. Additional resources include ICAN and the VBAC Facts Community where many activists participate. My daugher is about to give birth in Port Charlotte, Florida. I am in California. I was APALLED when she told me that she was told by her doctor that, because she had her first child by c-section she is REQUIRED to have this one the same way. WHAT? Are these people living in the stone age? She is perfectly healthy, the baby is perfectly healthy! There is absolutely NO REASON for this decision except to line the pockets of the hospitals and physicians. She is more at risk, the baby is more at risk when delivered by c-section. She has more recovery time and more vulnerability to all kind of complications that would not occur with a VBAC. I almost want her to fly out here for the next couple of weeks to have the baby on the West Coast. If we could afford it, I would have done it the minute I heard this invasive practice is “regulated”. Disgusted. I hear you. 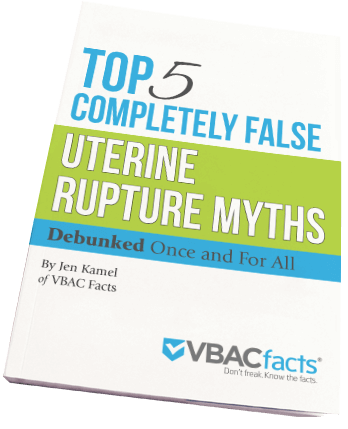 It is shocking, frustrating, and totally counter to what the National Institutes of Health and the American Congress of OBGYNs recommend in regards to VBAC. If your daughter does not want a cesarean, she can look for another care provider as hiring a VBAC supportive care provider is the #1 thing you can do to have a successful VBAC. Have her get a copy of her medical records & operative report from her first cesarean, get the names of VBAC supportive providers, and ask the right questions. Read more about planning a VBAC. Home VBACs are not legal in NJ. I may not agree with this, but it is currently the law. I did note in the article that “Some states, like New Jersey, permit midwives to attend homebirths, but not homebirth VBACs (HBACs).” Hopefully this will ultimately change. Is Homebirth legal in North Dakota? I don’t know, but I’m sure if you joined the ICAN email support group or the Birth After Cesarean email support group, someone there would know. You could also consider a traveling midwife. You might want to read I’m pregnant and want a VBAC, what do I do? for more information.